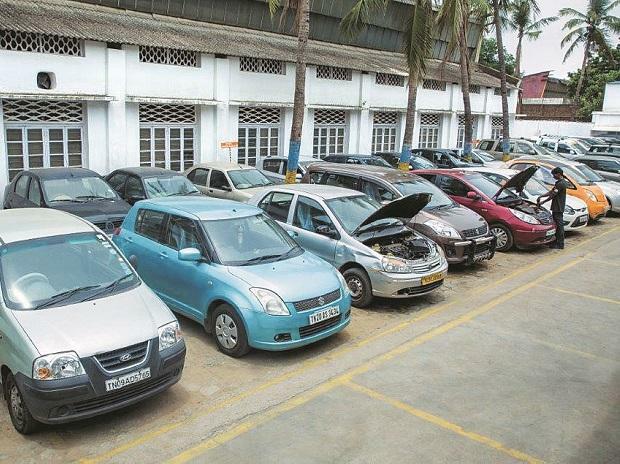 Maruti Suzuki, country’s largest carmaker, is set to close the year with a 50 per cent share in domestic market, while over a dozen large and small players together have another half of the market. Dominance of a single player is becoming the prominent theme of Indian automobile market, which has seen entry of multiple international players across segments. 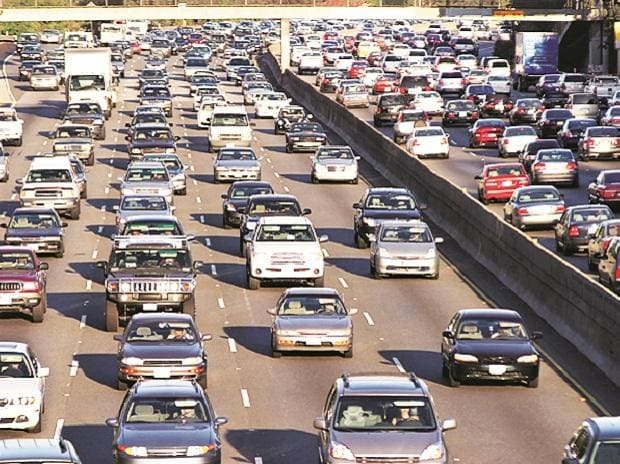 This dominance is not limited to passenger vehicles (PVs) — cars, utility vehicles and vans. Almost each segment of the domestic automobile industry is now dominated by a single player who sits on a minimum market share of 40 per cent. The trend is not limited to personal vehicles such as cars and two-wheelers, but also extends to various commercial vehicles and even tractors. In most of these segments, there is a wide gap between the market leader and the second-biggest player. The most extreme case of dominance is in the case of three-wheelers where six players operate. Bajaj Auto is biggest in the segment with a share of 58 per cent. Five other players, including Mahindra & Mahindra (M&M) and TVS Motor, are left with the remaining market. The second-biggest player, Italian brand Piaggio, has a share of 24 per cent. In scooters, the Japanese automaker, Honda, sits on a pretty high market share of 57 per cent in the Indian market. Aggressive moves by rivals have not been able to dent its share in a fast-expanding market. The remaining six players in the segment, including Hero MotoCorp and TVS Motor, together own 43 per cent of the market. TVS, the second-biggest player, has a market share of 16 per cent. 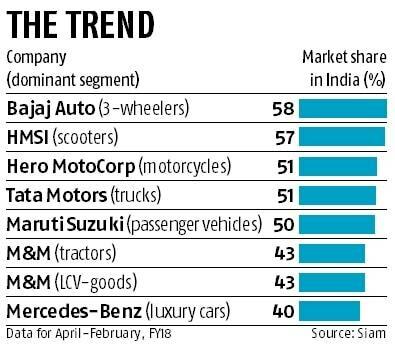 Home-grown brand Hero MotoCorp is the top player in the motorcycle market with a share of 51 per cent while the remaining 10 brands — including Honda and Bajaj together hold less than half of the market. The nearest rival, Bajaj Auto, is at 18 per cent of the market. Pawan Munjal, chairman and managing director (CMD), Hero MotoCorp, said last month that it was important for the company to hold and expand the domestic market share. “We need funds from domestic business to plough into the global business and R&D (research & development). We definitely want a higher market share,” Munjal said. Tata Motors’ market share in trucks may have marginally declined from mid-50s to 51 per cent but it still dominates the segment. Ashok Leyland has one-third of the market. Unlike most segments, trucks have remained the stronghold of indigenous brands in spite of entry of global biggies such as Daimler and Sweden-based Scania. The company also enjoys 43 per cent share in light commercial vehicle (goods carrier). German luxury car brand, Mercedes-Benz, leads the market with a share of over 40 per cent.